Is Bio Metric must for Travel Document. Visitor is reading Is there anyone going to Ocean City? Visitor is reading CAFE N ~ Back with a BANG !! Please log in to subscribe to MimroRaMero's postings. The postings in this thread span 25 pages, go to PAGE 1. Do not reply to this thread. Guys we hit the limit of the thread, so I had to start a new thread so please don't reply to old thread. I have started TPS status start to end 2.0, so please continue on that thread. Guys, please reply your TPS status in this thread, I will add manually to the list. Ps. If you have useful link, please, add in your post. Good luck to everyone. May God's blessing be with you. Please log in to subscribe to mangale's postings. For some reason I haven't got my TPS approval notice in mail. May be its lost. I got my EAD though on Aug 29. Please log in to subscribe to sanusaati's postings. Did you get EAD or it still showes your card has been mailed? Please log in to subscribe to suvaratri's postings. I received by EAD card yesterday...but other application still says finger print fee reveived and does not say Tps approved. Please log in to subscribe to highway_2_hell's postings. @ Dreamer007 Still haven't got the mail. TPS ma "REQUEST FOR ADDITIONAL EVIDENCE WAS MAILED" ani EAD MA "CASE IN PENDING AT LOCAL OFFICE"
i still haven't received the mail they just send it couple of days ago. Aba mail ayesi thaha huncha what they want bhanera. how long you've been OUT OF STATUS bro? Please log in to subscribe to Whateveritis's postings. Got by EAD by Mail on 9th SEP.
i need to apply for my Driver License but apparently DMV in VA does not accept EAD as proof of legal presence. So i need to wait for my TPS apporval Notice. My TPS was approved on SEP 1st but haven't it received yet. Does anyone still waiting for your TPS approval letter? i have received EAD but not TPS approval, so I called USCIS today and a guy said that EAD is approved because TPS was approved first so nothing to worry about...but my TPS application still says Fingerprint fees was received on July 8. Please log in to subscribe to zxcv's postings. Is there any chance of receiving mails from USCIS on Saturdays? Please log in to subscribe to basebook's postings. I have a question guys, a family friend of mine has been out of status for a while. So with this tps and ead approval, can he apply for drivers license. Basebook, I was out of status for 2 years and my tps got approved and received my EAD 2 days ago. But only haven't got a TPS approval letter. Please log in to subscribe to sgcfc's postings. Question to people who were out of status and got approved, what did u write under current immigration status?? Please log in to subscribe to bairaghi's postings. Got my EAD card today. But didn't see my old ssn anywhere in the card. What happens to my old ssn ? Please log in to subscribe to Dreamer007's postings. @highway_2_hell let us know wat it says on ur letter when u get it I guess u will get it earlier then me...I might get it early as well since I m right next to Nebraska but I m out of town so will not be able to check my mail. I m wondering if there's anything coz of working with social security without ead which I hav done it do u happen to have same case just wondering coz I know I send all the stuff they asked for and I double checked the form and I have filled every part. Please log in to subscribe to Zenith Shrestha's postings. I applied for my TPS on Nov 2. 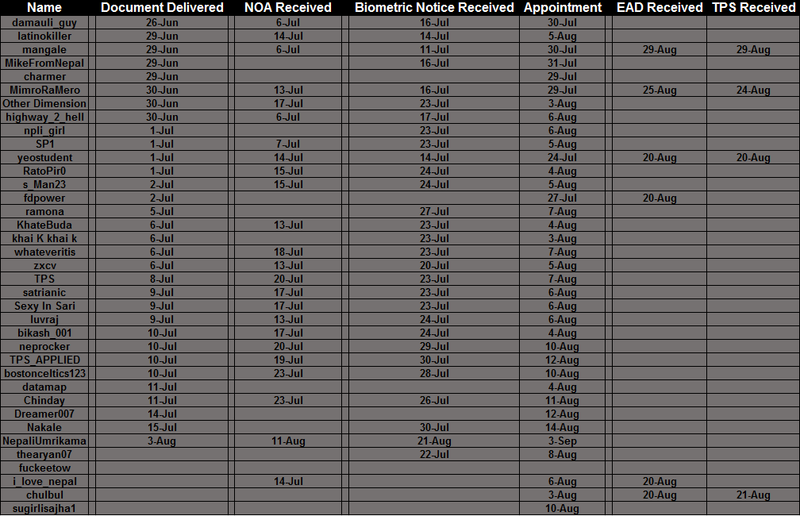 I gave my biometrics on Dec 16. My friend and I gave the biometrics on the same day at the same place. He received his TPS 10 days ago and I have not received it yet. Is that a problem. I graduated in Dec 12 2015. So, i don't have more time to apply for OPT either. So, should I apply for OPT now or should I wait until the very end date. And how long am I allowed to stay in the country after I file for OPT? Please log in to subscribe to ShankarHuShankar's postings. You have to apply OPT within 30 days after your DSO recommend for OPT. This seems new rule as per USCIS.